We usually do a five week puppy course. Each class is an hour long. The pups should be between 8-16 weeks and be at least two weeks post their first vaccination before they start. Through the five weeks, we go through all the common issues facing new puppy owners eg chewing and biting, digging, jumping up, housetraining etc. We will help you understand how puppies learn and how to use positive reinforcement techniques to make the experience with your puppy as enjoyable as possible. You will also have the opportunity to ask any questions you may currently have. The classes are run by experienced staff trained in animal behaviour & puppy classes and combine basic obedience (walking on a lead, coming when they are called, leaving articles they should not have in their mouths, sit, down, stay etc) with free interaction time and introducing your puppy to new and exciting things (eg playing with other puppies of different breeds and sizes, the agility tunnel, strange noises etc). Our goal is to help build the bond between you and your puppy and for you to have happy, well balanced, well behaved adult dogs in the future. We usually do a five week course. These classes are an hour long. The puppies should be over four months when starting the classes. If the puppy has not done Puppy One, a one on one class will be done to teach the puppy the obedience commands and then integrate them in a Puppy Two class. 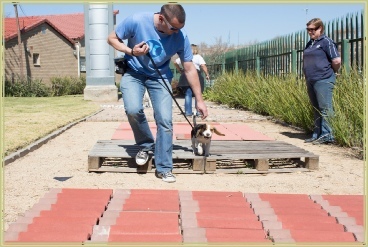 During this course the puppy will be taught some self control and discipline in a fun and enjoyable way. As the puppy gets older they become more challenging and it is important for the handler to continue to reinforce the behaviour and training done in Puppy One. 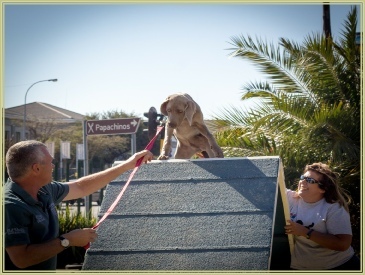 The puppy will be prepared for walks outside their environment (to stop lunging and barking at other dogs/people and learn to do heelwork with distraction), taught manners going through a gate (so that the puppy does not take off through an open gate), improve on stays (both sit and down), be able to cope being examined by a stranger (teaching the puppy to remain calm and not bite or jump up), manage while their owner is out of sight (to identify and work with pups displaying separation anxiety) and to continue with some agility etc.